not something visible by the eye, and is 20-30 miles wide and changes in latitude slightly each year, though normally between 49S and 55S. It was first crossed in 1675 and described by Sir Edmund Hilary in 1700. 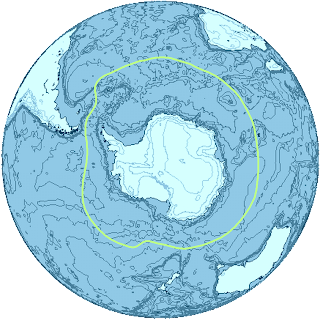 The Antarctic convergence zone is where the cold antarctic waters mix with the slightly warmer subantarctic waters, the colder waters sink below the warmer waters creating a highly important zone for Antarctic Krill to feed. The Antarctic Convergence Zone is natural like the Arctic tree boundary, however it not only separates 2 hydrological zones but separates two areas of distinctive marine life and climates. This is a highly important area that is currently being monitored very closely as sea temperatures change in the warmer zones. Krill is critical to almost all species that reside and migrate to and through Antarctica. Both the mixing and upwelling and health of the ice and glaciers are habitats and feeding zones for krill and other microscopic animals. There are many threats facing all areas of marine and ocean life, the threats to Antarctica start from us and where we live and what we do. It does not matter how far away you are from any ocean or sea, our actions can still make a difference. In a series of blog posts coming soon I will write about some of the further changes we are making and how easy and cost effective they can be. Whether you believe in climate change or are skeptical about the impacts and future, ignorance does not count. Small things can create a big difference not just to the environment but also to you, your family and your life.